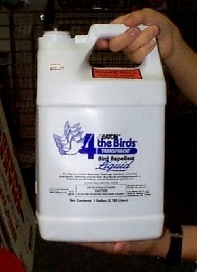 PRODUCT NAME:   4-The-Birds Liquid treatment. where nuisance birds are roosting. bird or nuisance animal that is roosting where it is not wanted. absorb which will result in a decrease in effectiveness. RATE OF APPLICATION:    One gallon can cover up to 1000 sq/ft. Use a pump sprayer for applying it or paint it on.